The Hayling Billy Trail was created on the trackbed of the railway line between Havant and West Hayling. The trail, on Hayling Island, runs through the Hayling Billy Nature Reserve which is managed by Hampshire County Council. 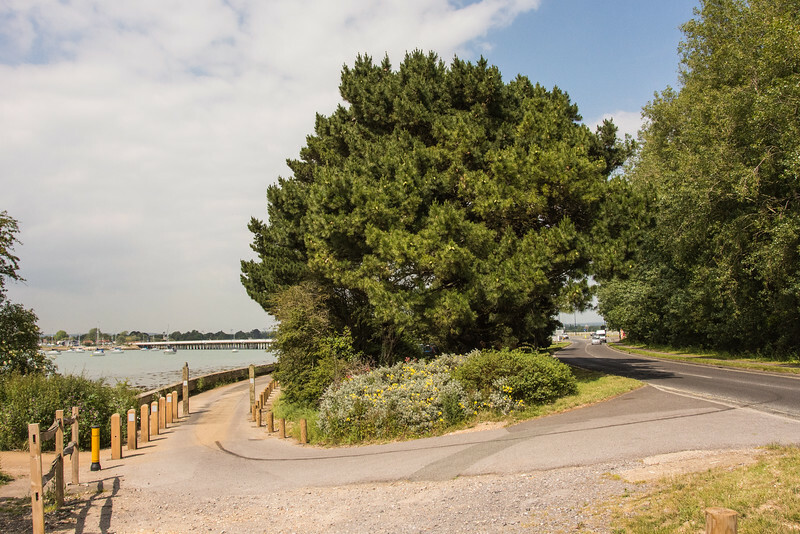 At North Hayling, Havant Borough Council created the West Hayling Nature Reserve on land formally occupied by the Oyster Company and called the Oysterbeds. 16 June 2015. This is the entrance to northern car park, slipping off the Havant Road (on the right). In the distance can be seen the road bridge, built in 1956 to replace the life expired 1824 structure. The slip road and car park have been completely remodelled in 2014. The wooden posts were installed to provide segregation for horses, cyclists and pedestrians from road traffic accessing the car park.